Happy Pancake Tuesday, I’ll take any excuse I can get to eat pancakes around the clock! I have a confession. Don’t tell my family, but I rarely make pancakes from scratch. I used to all the time, but then I started trying to cut back (I have no off switch when it comes to those delicious maple soaked cakes), and my husband isn’t crazy about them (not sure let him into the family), then I discovered the ultra cheap pancake mix at Costco it totally put a halt to the 15 ingredient pancakes I had been making for a lifetime. Although I’m a slave to the giant bag of ultra cheap cheater mix (it could seriously feed a small army for $8), I still like to spice things up and treat the family to an extra special breakfast with the perfect pancake. 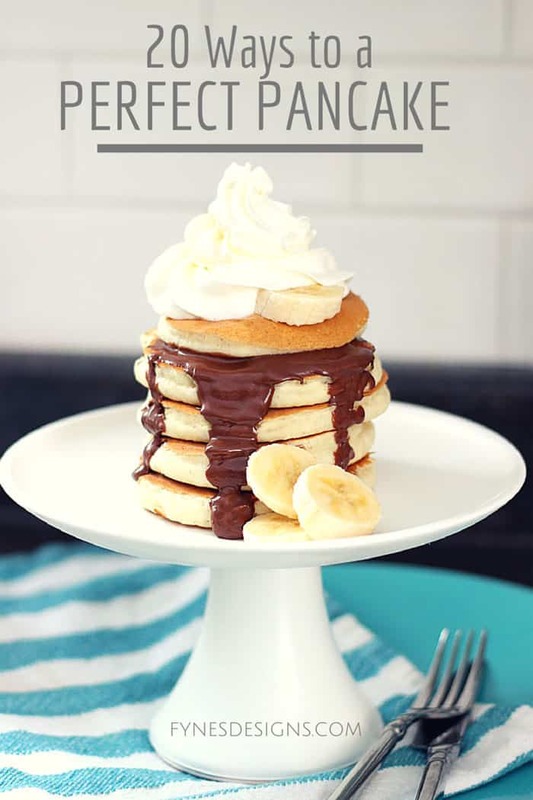 A few of these suggestions are batter additives and some to top your flapjacks with, regardless the perfect pancake awaits… even if you are a cheater! One has to be the most obvious- Maple Syrup– Maybe it’s because I’m Canadian, but I think I could have it with a straw, and skip the pancake! Berries– Strawberries, blueberries, raspberries, blackberries, in or on top, even in a sauce, delicious any way. Nutella– A few tablespoons mixed into the batter, or as a delicious spread on top. Bananas– Try one mashed and mixed into the batter, or sliced on top. Cinnamon– A little dash just a pleasant hint of spice, or you could try this Cinnamon Roll Pancake idea (to-die-for). Jam- Spread on top with butter, or swirl a bit into the pancake when it is on the griddle. Sprinkles- Throw in 1/4 cup of sprinkles for a party in a pancake. A real kiddo pleaser. Double as Crepe mix– Crepes have more eggs, and are much thinner and delicate than pancakes, but you can follow this easy recipe to turn your pancake mix into this delicious european staple. Whip Cream- Really how can you go wrong here, the can is most common, but every once in a while after dessert leftovers we make a point of cleaning it up with pancakes. Bacon bits- A Crumbled bacon additive is like wrapping breakfast into one delicious package. Chocolate Chips– A family favourite, not to mention super easy! Nuts and Raisins- This may remind you of a granny pancake, but a little crunch and the sweet and salty combination make for an interesting and delicious pancake. Crushed Pineapple- Add a little bit of the tropics into your mix, be sure to drain well first. Cream Cheese Glaze– What doesn’t cream cheese taste good on? Get the recipe here. Cocoa- Chips or Nutella not enough? Add in approx 3tbsp. of Cocoa and 1Tbsp. of sugar for a delicious chocolatey pancake treat. Peanut Butter- Blend in a 1/2 of smooth peanut butter for a protein punch. Lemon- Add in 1/4 lemon juice and a little scrape of rind to give your pancakes a zippy zest. Or maybe a dollop of delicious lemon curd. Apple slices or Apple Sauce- I love anything apple, a little crunch or a drizzle of sweet homemade apple sauce makes my taste buds dance! Omelette pancake– Throw in some typical omelette ingredients for a hearty start to your day, ham, green onion, and grated cheese are my favourites. There you have it, 20 ways to a perfect pancake mix. While I love a crispy pancake smothered in butter and maple syrup, Nutella, sliced banana and whip cream come in a close second. 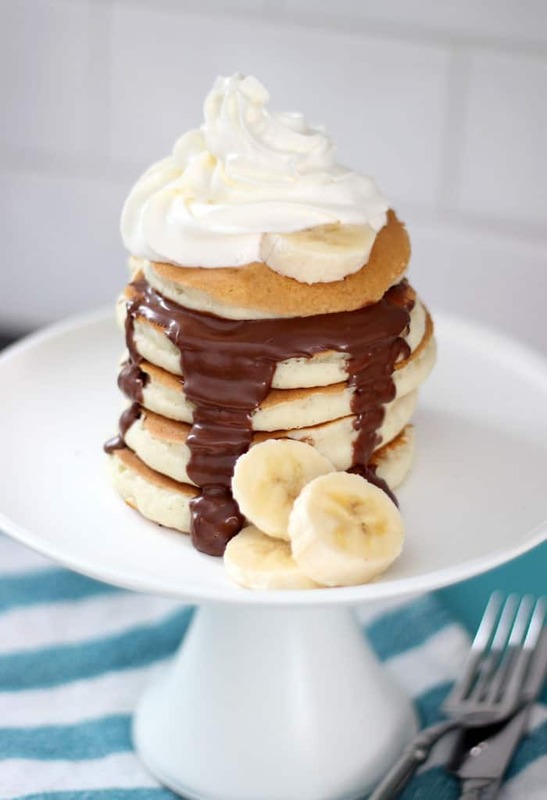 What is your favourite way to have pancakes? I’ll take the one in the photo. YUM! Wowza! I want that pancake! What a great list, Virginia! I’ve pinned it so I won’t forget these awesome ideas! join the club! I love them any way I can get them!